It’s a good friend who knows what kind of gift you will appreciate. It was a good friend who recently gave me a bag of dried Rancho Gordo Christmas Lima beans. I had heard of Rancho Gordo before, and I seem to remember that around the holidays they sold a year-long bean subscription that I considered buying myself for my birthday. My friend’s gift inspired me to check their website for cooking tips, which, of course, led me to the online store. And they sell so many kinds of “glorious, old-fashioned heirloom beans” that I imagine I will be spending much more time there in the future. And ordering glorious beans galore. It’s a small indulgence, really. The recipe suggestions for this chestnut-flavored bean ranged from curry to sauteed mushrooms to gorgonzola sauce. I liked the idea of the curry flavors and I planned to serve the curried beans with this jeweled rice–but once the beans were cooked they were so good that I couldn’t bear to adulterate the flavor. Instead I tossed a few cups of the beans with fresh herbs and a splash each of olive oil and good sherry vinegar. I cooked a pound of dried beans and used about half for this dish. Maybe I’ll feel ready to curry the other half later this week. 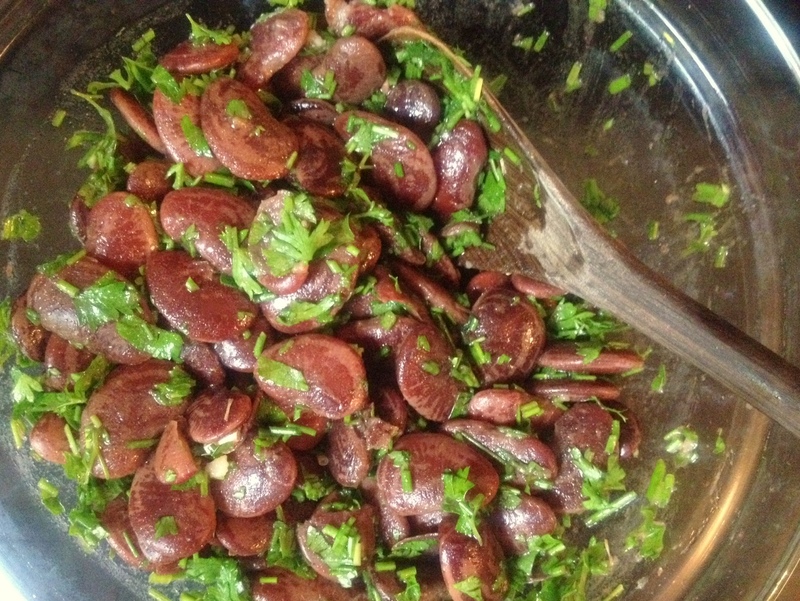 Christmas Lima Bean Salad: Cover 1 lb. Christmas Lima beans generously with water. Bring to a boil, then lower heat and simmer covered until completely tender. Start checking the beans after 45 minutes, and add 1 tsp. kosher salt when the beans are nearly tender. (Add a cup of water if necessary to keep the beans submerged.) When the beans are completely tender, turn off heat and taste a bean, adding more salt to taste if needed. Allow the beans to cool a bit in the cooking liquid. 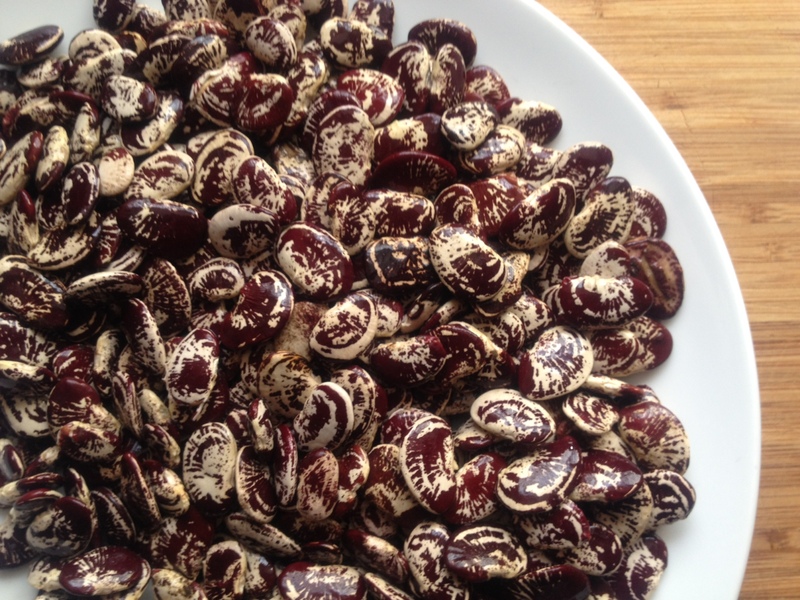 While the beans are still warm, drain them (save that cooking liquid for stock for a bean soup!) and toss with a good splash each of good olive oil and good sherry vinegar. Grate a garlic clove into the beans with a microplane, and add a few big handfuls of chopped chives and parsley. Toss again, taste and adjust flavors if necessary, and serve. This entry was posted in Beans and Other Legumes, Easily Multiplies to Feed a Crowd, Food, Recipes, Salads, Vegan or Would-Be-Just-As-Good-Vegan and tagged bean recipes, bean salad recipe, heirloom beans, Rancho Gordo beans, vegan recipe, what makes a good gift on July 19, 2012 by emmycooks. Thanks for sharing this recipe. I have not seen this before and always like trying things a different way! Looks delicious! I had never even heard of this kind of bean! I think I’m going to be trying more beans I had never heard of, though, now that I see all the varieties that are available! I love this idea! I just bought a pound of dried cranberry beans at the farmer’s market–I wonder if this would work with them too. I think this oil/vinegar/herb combo would work for any kind of bean. I have mostly used cranberry beans in soups, so let me know if you like them as a salad if you try it! Wow, I might have to indulge in a little bean subscription service myself! Those beans are beautiful! haha! That’s why I love it too! I love these beans, they are available at my grocery and I pick them up because I can’t get enough of the meatiness of them. I like to cook them with some crushed tomatoes, garlic and onion. Which I always season nice and serve with rice. Yum. Jealous! I have a Rancho Gordo Bean Sampler on my wishlist. I may have to break down and just buy it for myself. Rancho Gordo! That takes me back. Bought my very first quinoa years ago from them. And I love their Mexican Oregano. But tell me about the texture of the beans…I have issues with the mouth-feel of lima beans – – but these are so temptingly gorgeous! I hadn’t heard of Rancho Gordo before and now I’m psyched to try them out. Summer bean salads (hot or cold) are in my top ten right now. Trying to eat fewer refined carbs these days so I can be a little less ‘gordo’ myself! I love these beans! I have been putting them into salads all week, so I may have to order more to try out the curried bean recipe.